Scrub the potatoes and slice them into 1/8-inch rounds. Use a mandolin for evenness if you have one, or a sharp knife. Lightly grease (I used butter) the bottoms of four ramekins. 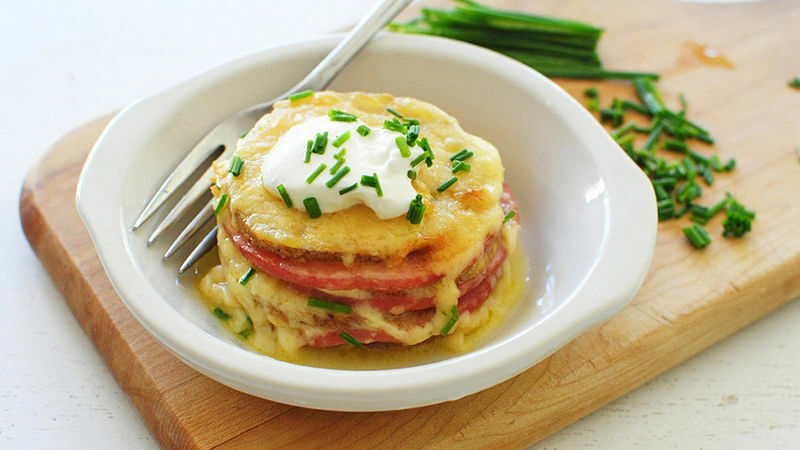 Place a potato round in the bottom of each ramekin and layer with cheese and a disc of Canadian Bacon. Keep layering until it peeks out of the top of each ramekin. Top with cheese. Bake for 45 minutes, until the cheese is melted, browned and bubbly, and the potatoes are fork tender. Dollop with sour cream and chives. Serve immediately. This is pretty meaty, so feel free to lessen the amount of Canadian Bacon slices or go meatless if you prefer. You may even get 5 ramekins out of the two potatoes, depending on their size. Take that traditional baked potato and TRIP.IT.OUT. And by that I mean we're stacking. We're stacking little potato rounds with lots of cheese, Canadian bacon discs, and more cheese. And then a little more cheese. And then a lot more cheese. It's such a fun twist on the baked potato because you can see all the pretty layers of potato, meat and cheese. Speaking of meat, I said this in the recipe and I'll say it here, too. It's pretty meaty. Most dudes will flip their whole faces. So if you want to skip every other layer of the bacon, you can totally do that. It's up to you! That's the beauty of it. You can decide your fate. Your Canadian bacon layer fate. I made a sweet potato version on my blog a while back, but I thought it would be fun to try another version here today. With you. Together. You and me. Start by slicing your potatoes into rounds. I used a mandoline to make it WAY faster, and to keep them perfectly even. Grate your cheeeeeese. I used an aged white cheddar. Then you just stack! Lightly grease the bottoms of four ramekins, and start with a potato round. Then cheese, then a disc of Canadian bacon, then a potato round, then cheese, yadda yadda. Stack them up like this! You'll place the ramekins on a baking sheet and slide them into a hot oven for about 45 minutes. Watch that cheese. Watch it melt and bubble and brown and sing to you. Then check to make sure the potatoes are tender. Bam. Ready. Let them rest for about 5 minutes before you serve. IF you can. Glory lands. You can totally serve them in the ramekins like this, and use your fork to treat it kind of like a mini-casserole. Which is awesome. Or you can serve them like this! See those layers? You rule. Bev says, "Gosh darn it, you have to try this." For more musings, visit her blog Bev Cooks and her Tablespoon profile.